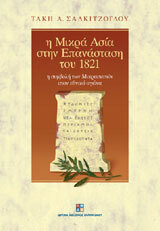 The book by Mr. Takis Salkitzoglou demonstrates and event that is not widely known, the wide participation of the people of Asia Minor to the Greek Revolution in 1821 and their important contribution to the liberation of their common homeland. The beginning of the Greek Revolution was a calling to all Greeks, not only in mainland Greece but also those that compose the Hellenic world. This calling was answered by the Greeks beyond the Aegean and were incorporated in the armies of the chieftains, while later they formed a special army, the Column of the Ionians. This book, the result of extensive research by the author into sources and archives, narrates the situation in Asia Minor both before the during the Greek Revolution: the initiation of Asia Minor people into the Philiki Etaireia, the upsetting events that followed, like the destruction of Kydoniai (Aivali) and the massacre in Smyrna, but also the incorporation of the people from Asia Minor in the fighting units. The adventure of the rescue and settlement of the refugees in Greece is also presented. The book includes an extensive catalogue with the names of Asia Minor fighters (with the areas of their origin), while documents are published that testify to their participation and contribution to the national struggle. The Book is on sale at the Museum Shop, in the Cultural Centre of FHW, as well as at major bookstores in Greece. For further information contact the Museum Shop of the Cultural Centre, tel. : +(30) 212 254 0000 or write at sales@ime.gr.